Shine Dental Care welcomes new patients travelling up the M1 from Beeston for our leading dental implant treatments. Our cosmetic dental clinic in Mansfield has helped provide effective and long-lasting dental implant treatments that have given our patients confidence in their smile. At Shine Dental Care, we provide leading cosmetic dental implant treatments that guarantee fantastic, natural results. We have decades of experience, use the latest technologies and employ innovative techniques to deliver the results new patients from Beeston expect. 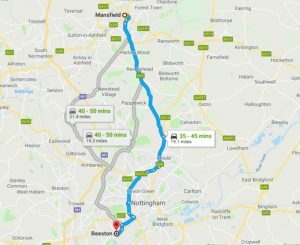 Why do new patients from Beeston travel to see us? We welcome patients from Beeston because of the leading dental implant treatments Shine Dental Care offers to Nottinghamshire and South Yorkshire. Our highly experienced team can design a dental implant treatment that gives you the results you want, right in our Mansfield cosmetic dental clinic. Success rate: Dr Heath our implant specialist has had a near 95% for single teeth and close to 100% for implant bridges. Price: Shine Dental regularly compare our treatment prices with other similar dentists in the Sheffield, Nottingham and Carlton area. Our fees are highly competitive. Can I have implants? One of the reasons patients travel to Shine from Yorkshire and Lincolnshire, is that we have a reputation for complete transparency. If we do not think you are a perfect fit for implants we will say. We assess all patients for suitability before undergoing any treatment.